We have had more then 700,000 downloads of our apps since 2010, and we don't have any way to contact those people or know who they are outside of our apps. For in-app engagement I highly recommend the Apps Fire Booster SDK which I did a blog post about awhile ago. However, I think we need to be doing more to stay in touch with our users. I talked with Jody Burgess who runs a strategic marketing company and she planted a bug in my ear about collecting e-mail addresses. I decided that collecting e-mail addresses would be a good idea, but I wanted to make sure we are adding value for that e-mail address and that we don't spam our users. 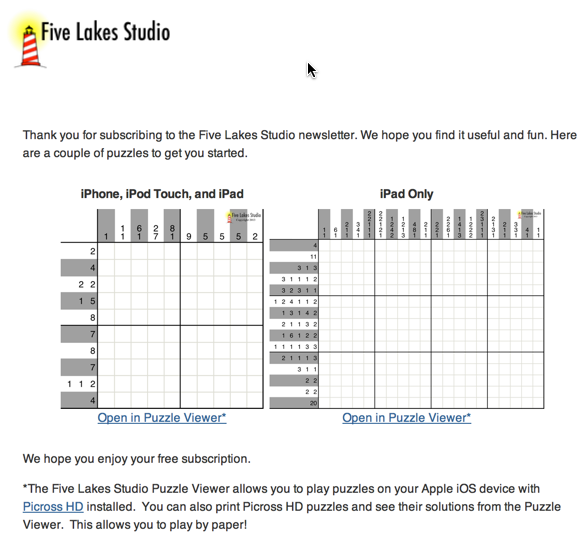 Ken and I decided to add a newsletter signup to Picross HD. We added a simple signup process that will prompt users to signup for the Newsletter. The signup offer will be shown after several launches of the App or upon request. We are using a double opt in process that requires the user to ask to signup for the newsletter as shown above and via a confirmation e-mail. We are using mailchimp.com to manage the e-mail lists for us. This helps us stay in compliance with different e-mail laws and manages all the opt-in and out stuff. They also have a simple little api called ChimpKit on git hub. I wish they had done a bit more work on it as it's just a very thin wrapper around their rest api, but it is still useful. They also support localized e-mails, but I have had a hard time getting that setup correctly. For this first pass, I'm just going to go in english, but I would like to support japanese better in the future as about half the Picross HD user base is japanese. 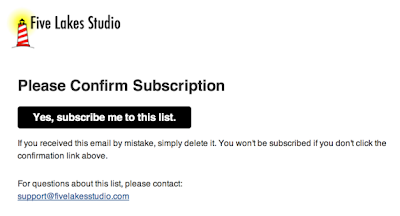 At the time of this writing, we haven't gone live with Mailchimp so I don't know how well they are going to perform until we get a few e-mail campaigns under our belt. 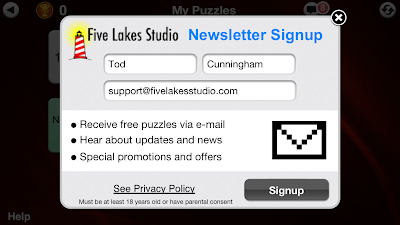 We keep the e-mail really simple so that it has the best chance of being opened by various e-mail readers, but when you click on one of the puzzles it will open the puzzle in our puzzle view. 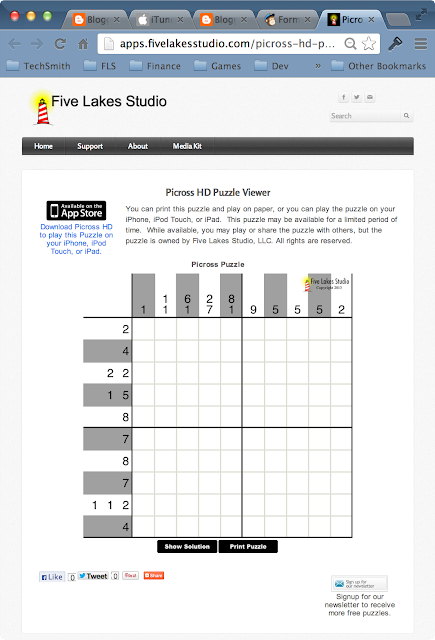 If you are viewing it on a computer it gives you the option of download Picross HD through iTunes or print the puzzle. You can even show the puzzle's solution so it's possible to play the puzzle with pen and paper. We hope users will play it in Picross HD, but we want people to share our puzzles with their friends and have no barriers to playing our puzzles. The nice thing about the Puzzle view is we will also be able to do some social campaigns on Facebook and Twitter. I plan on posting free puzzles to Facebook and Twitter which will bring people to the Puzzle viewer. They will hopefully enjoy the puzzle and choose to signup for the newsletter or download Picross HD. In addition to Picross puzzles, we plan on making Hashi puzzles available through the newsletter. We think people who like Picross puzzles will also probably like Hashi puzzles and this is a way to introduce them to Hashi puzzles and our Hashi app. We will also use the newsletter to talk about upcoming releases and news we think our users may be interested in hearing about. It's kind of amazing all the possibilities that open up just by having interested user's e-mails. I'm excited to see how this goes over with our users and through our planned social campaigns. Thanks for reading and be sure to visit us at Five Lakes Studio.